Here's my card for the current seasonal sketch challenge at CAS Colours and Sketches. 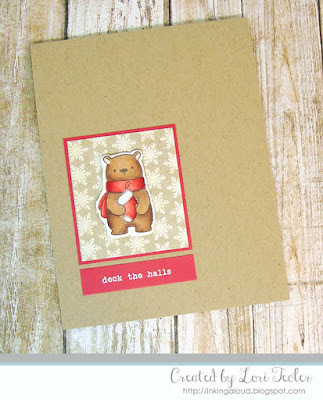 My holiday themed design is based on Sketch 261 from February. The layout's small panel was the perfect size for one of the cute images from Hello Bluebird's Frosty Friends stamp set. I colored up the bear with Copic markers, then used my Scan 'n Cut machine to cut out the colored image. For some texture, I added a bit of white flock to the stocking in the bear's arms. The image was adhered to a snowflake patterned paper panel using foam tape. I matted the panel on contrasting red cardstock before adhering it to a kraft card base. The "deck the halls" sentiment from the Typed Christmas set was stamped in white pigment ink on a narrow red cardstock strip, then heat embossed in white to pop against the red. I positioned it directly underneath the image panel to finish the design. So adorable! I love that sketch - it is great for those small images. The flocking is a perfect touch - the stocking looks so soft! Thanks for playing along with us at CC&S! Oh my! What a darling bear, thanks for joining us at CC&S. Hi! Such a lovely and cute bear! !